The photo of the brush reveals a great deal about my approach to cleaning. Take a closer look and you'll see what I mean. It's not the most eco-friendly sweeping brush in the world. Just look at all the garish colours on the plastic handle. The manufacturing process of making it must be much more complex than that of a plain old broom. 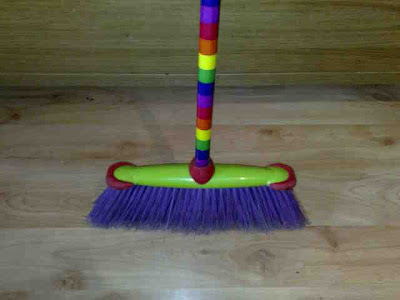 However, even though I am reasonably environmentally-friendly, I make no apology because this multi-coloured brush is fun and as I am no domestic goddess, it makes the job of housework just that little more palatable. I'd love to tackle cleaning with the same levels of joy as Kim and Aggie, the UK's "Queens of Clean", but I think I'd need a whole personality transplant to make it possible. You see, I'm more like cinderella, easily distracted by chatter, sing-song and the thought of going to the grand-ball. However, with the little that I manage, I have stepped back and reassessed my habits, not with regard to how to clean better (that's beyond help) but how I can produce less waste in the process. Regular readers will have noticed that since starting The Rubbish Diet, I have changed my food shopping habits. I have also made some changes to my range of cleaning products along the way. Before, I had been a real fan of everything disposable, things you could use once or perhaps several times over and then throw in the black bin. If I was expecting visitors, you could almost hear my black bin groan with exhaustion, filled to capacity with cleaning products and forced closed withing seconds of the doorbell ringing. 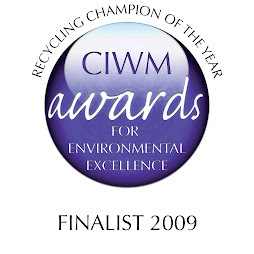 So, second to food waste, cleaning waste has undergone the widest review. 1. Washing up sponges, which were once bought in large packs. Their life would start at the kitchen sink, then plunge the depths of the bathroom sinks, followed by a quick flirt with the toilets before being sent to die in landfill. 2. Anti-bacterial wipes, for surfaces, floors and toilets, which would be used once and sent the same way as the sponge. 3. Lots and lots of kitchen roll, used for light-cleaning of surfaces and windows and a saviour for quick mop-ups, where the final destination for the soggy paper mess was again landfill. 1. A reusable sponge that can be thrown in the washing machine (along with my trusty old mop cover) and washed 300 times and I bet even after that it will still be useable. 2. 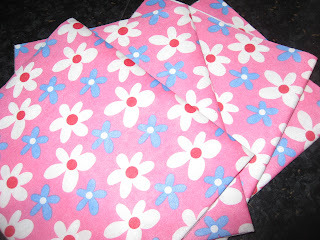 A pack of four very pretty looking cloths (remember, I need the injection of fun), which can be used for all kind of surfaces, (even cleaning windows) and then washed again and again and again. 3. A vileda heavy-duty floor cloth, which will tackle even the most difficult of tasks. I admit to keeping some kitchen paper because after such a life-long dedication, it would be hard to give that up completely, but I have now changed to a Recycled product. 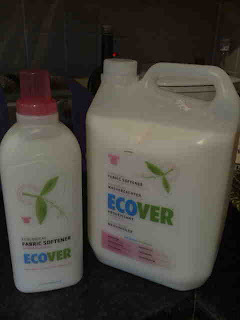 I now only use it for light tasks, dipped into ecover washing-up liquid and can then discarded into the compost bin. With Zero Waste in mind, these changes have proven to be extremely effective in reducing my residual waste and I have seen a great impact on the bin. Admittedly, I did spend a few extra pounds than might have been necessary and if this is a consideration, alternative suitable products could be sourced from hardware stores as well as local markets. For those who want to take things a step further down the path of environmental enlightenment, I can recommend the range of Ecover products. As well as being environmentally friendly, Ecover's range offers another bonus to eco-aware consumers and that is the option to SUPERSIZE. You won't normally find Supersizing being recommended with any form of diet and certainly when thinking about attempting size zero the word would would send shudders down certain spines, but not in this case. If you're attempting to reduce your waste rather than your waist, supersizing with products such as Ecover is the way to go, as it also helps to reduce the packaging sent for recycling and in addition to that it can save some money too. The starting point is to upgrade from a 1 litre bottle to a 5 litre container of your usual product. These can be found in local shops such as Bury St Edmunds' Butterworths or the local Longwood Farm, which is a few miles outside of the town centre. Wiggly Wigglers also offers a ReCover service, providing refills on as many products as possible, They even include a free return-postage label so you can send the empty container back when finished. If you live in or near Bury St Edmunds, Longwood Farm in Tuddenham St Mary also offers a refill service, where you can take along your empty containers and refill them on the spot. With all these options available, it should make my cinderella duties all the more easier. However, I still prefer my usual distractions, even if there is risk of my carriage being turned into a pumpkin at midnight. At least it could be carved, cooked and composted. I've made many of the same changes but wondered if you knew you could have simply boiled your old sponges for five minutes and they would have been germ free. I'm guessing you could do the same with your new sponge too. Hi N.&J. - that's a great top ti. I never knew you could do that with sponges. Thanks for sharing. I won't throw the old ones out now. 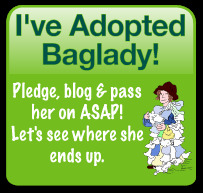 That's another thing saved from the bin. Hi Picklesmum - yes I love that range. I think there is no problem putting your washing brush into the dishwasher. It will get rid of all the germs and will help it last longer I am sure. I didn't know E-cloths made sponges. I'll have to look out for them. I hadn't thought to boil my sponges but my problem with them is that the scouring material disintegrates quite quickly and can also get rather badly gunged up, particularly by bread dough, but also other things that stick to it and won't wash off. 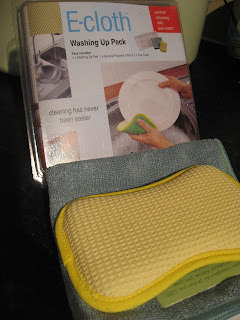 If the E-cloth sponges are more hard wearing they will be a definite improvement for washing up, but I'm not sure what I'll use for really dirty cleaning jobs when all my old sponges are gone as sometimes all you want to do is throw the cleaning cloth away. I wouldn't wash something in the washing machine if I'd used it to clean the loo or worse - although now we no longer have a cat there might not be anything worse. Hi Karin - the ecloth is great. I've still kept a couple of the old sponges, one of which I put in the washing machine with my floor mop. A really hot wash should to the trick with it. I got my ecloth sponge in a pack from Waitrose. I bought one yesterday, got it home and then realised it came in a whacking great stiff plastic package - how environmentally friendly is that?? Still if I don't need more than one or two I won't have to do that more often, but I might drop them a line if I have the time. I was tempted to post the packaging back to them.